Nantucket Island in the summertime— a dream come true, right? Not for twelve year old Adelaide, whose father died a year earlier and now has one ambition in life: to be a great explorer and adventuress like her idol, Amelia Earhart. Adelaide loves fantasizing about the future exotic places she’ll travel to, to help her escape what’s really going on. To Adelaide, going to her grandparent’s house on Nantucket for the whole summer, with her younger brother Louis in tow to take care of, sure doesn’t fit the bill. She thinks. . .
Adelaide couldn’t be more wrong. When, at her grandparent’s house, she decides to go out exploring when she comes across an extraordinary white rose in her grandmother’s island garden. She clips it and boom! A chain of events is set in motion that pull her into another world of the Hidden Forest, a realm where she must battle the Merqueen to save her younger brother Louis, with the help of Max the Sankaty Lynx, McFadden the faerie fisherman and King Micah, a Native American islander. Through doing so, Adelaide ultimately is able to bring herself back to life. 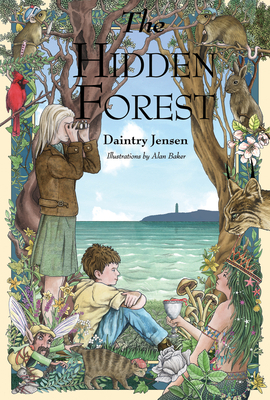 The Hidden Forest is a middle grade fantasy/adventure novel in the tradition of The Lion, the Witch and the Wardrobe and the Redwall series. Set on the magical island of Nantucket, it is a story of learning how to grieve and heal the past in order to live in and embrace the present. One could say the theme is the only way out of the forest is through the forest. Daintry Jensen has a background in dramatic writing, from studying theater at Skidmore College and graduating from UCLA’s Professional Screenwriting Program. Before that, she was acting professionally in Los Angeles and NYC. Before that, she was spending her summers on Nantucket Island where she had many an adventure that sparked the imagination, and where she returns to whenever she gets the chance. She’s currently working on another novel set on Nantucket and several screenwriting projects. Alan Baker is an award-winning freelance illustrator living on the rural south coast of England. His work is used in a variety of fields including editorial, advertising and packaging, as well as adult and children’s publishing.He is the author and illustrator of over forty children’s books published in over twenty different languages. He has also illustrated books by Joni Mitchel, Louis de Berniere and Michael Rosen.